I nearly fell off my chair after seeing her on the February issue of Vogue. Taylor Swift has never looked BETTER! She looks stunning and uber chic. This cover is a big step up for TaySwift in my opinion. I'm in love with everything about this cover. 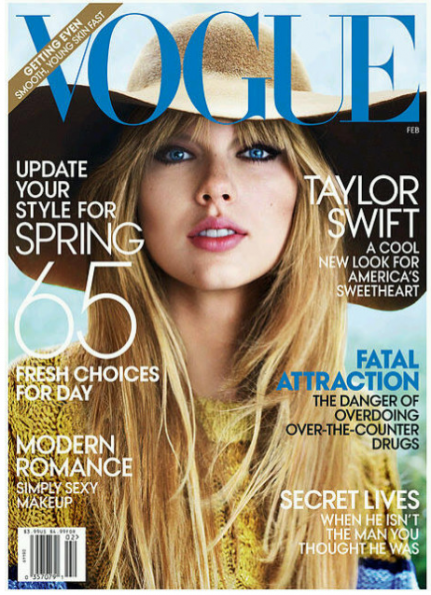 Vogue has seemed to transform the "our song" girl to "super glam" girl. The colors are simple. You have the blues and golds/yellows which perfectly complement Taylor Swift. Her outfit, makeup and accessories are not overwhelming, and instead the on-looker is able to focus on the chicness of the image. The simplicity and softness of her tresses, topped of with the classic hat is incredible. The light hues of blue and gold yellow are seen as the only colors pulling the entire image together, creating a perfect balance. Something so simple about the image, yet it's very impacting. Vogue did an excellent execution of this cover! I am obsessed obsessed obsessed with IT!! I haven't loved a Vogue cover this much in a long while. Completely satisfied with this cover. It's allowed me to see past the once 15 year old country song bird onto now, a young woman embracing the fashion world.